The À l'abri de la Tempête microbrewery has been a flagship brewing company in Quebec since 2004. Your hosts, Élise and Anne-Marie, will happily share their knowledge, while you sample their range of classic beers or discover their most recent limited-edition brews, called "Palabres." As you enter, you see walls showcasing a truly impressive collection of exotic beers. When you reach the brewhouse, a documentary video will teach you the subtleties of the brewer's art and the distinctive aspects of this one-of-a-kind microbrewery. You'll also learn about the benefits of a local algae, which is used in making the beers. 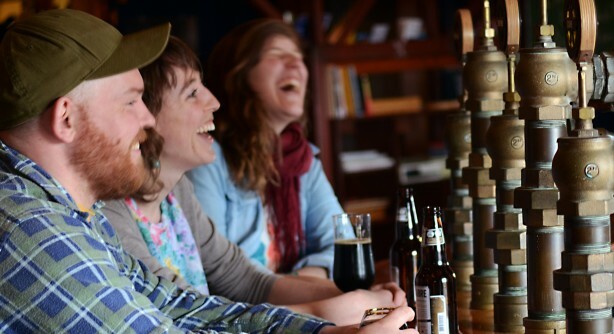 The microbrewery's most unique elements include its use of Madelinot products in beer recipes and its links with island businesses. For instance, grain smoked at the Fumoir d'Antan forms the heart of the Corps Mort barley wine. Your taste buds will also love the fruity and bitter flavours characterizing the rosehip and cranberry Palabres, which are made with fruit pulp from Gourmande de Nature. The draff, or the remains of the malt used to make the beer, is also put to use, feeding the sheep and cows at Moutons du Large and at Le veau des Nathaël. Being able to indulge in a stroll on the beach only minutes away from a popular microbrewery is a pretty typical experience in Îles de la Madeleine. À l'abri de la Tempête is the only thing adjacent to the Dune de l'Ouest beach, which is an ideal location for a picnic on the sand. And if you don't feel like walking, you can sit on the terrace and enjoy a clear view of the lagoon.